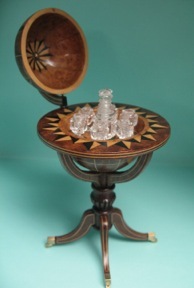 2016 Miniature Art Prize entry collaboration by Michael Walton and Jim Irish: Cut Crystal Decanter and 6 Glasses on Stems by Jim Irish inside Globe on Stand by Michael Walton. Miniature Art Prize is an independently organized international miniature art competition for miniatures in 1:12 scale, 1:24 scale, 1:48 scale and 1:144 scale. Annually in April, miniature art from around the world will be exhibited at the Hyatt Regency, located at 1800 E. Golf Road in Schaumburg, Illinois.